11:07pm Hot Tub. Anthony, Kyra and Cory. Anthony to Kyra – have they given you any.. Kyra – who’s they? Anthony – anybody. Has anyone said I think Anthony knows or Cory knows? Has anyone given you the impression that they’re upset with you? Kyra – knows what? Yeah Dane. Anthony – has anyone given you the impression that they’re upset with you? Kyra – Dane and Adam. Anthony – that they’re upset with you? Kyra – yeah. Anthony – okay, we’re going to switch that around. Kyra – So I asked Sam if Adam was pissed off at me.. he is acting weird, he is acting shorter with me than usual. And apparently Dane and Adam know that know that I told Cory that someone wanted to backdoor them. But they’re watching me like a hawk. Anthony – yeah that’s fine. But nobody as said anything like I know you said.. Kyra – no. Good, because the second that happens we need to use Kiki to put the blame on her. Kyra – how are we going to put the blame on her? Anthony – easily, right now Kiki is scrambling and throwing numerous peoples names under the bus. She’s thrown your name under the bus, My name, Cory’s name. And she has also thrown Danes name under the bus. Don’t even share that with Sam. Anthony – keep it to yourself and if anyone adds pressure that’s what we’re going to do. They head inside. 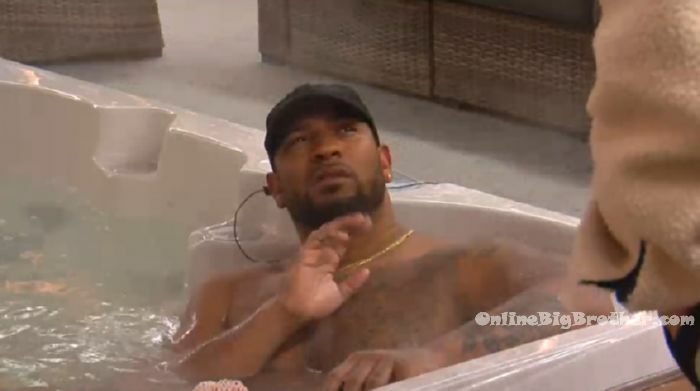 11:35pm Sam and Adam in the HOH bathtub. Sam – Kiki… Esti counting out her numbers ..you know we need to get Damien out.. and Cory out Antony.. and then like you know like the five of us can just move around .. and like her math doesn’t sense .. like when we get to they triple her math doesn’t even make sense. And then she is like I am just so sick of people using me. And I was like MMMMHHHmmmm. Adam laughs. They p!ss together, eat together, they sleep together.. like one of them has to go! 1:50am Esti and Dane are running around the house doing pranks. They take everyone’s water bottles and hide them in the secret blood veto room. Then they put apple juice around and on the outdoor bathroom, but Big Brother tells them not to so they clean it up. They wanted to put peanut butter on the bedroom door handle and something with the toilet paper but big brother tells them to go to bed. Please consider making a donation. Any amount is greatly appreciated. All donations go directly to paying for the considerable cost needed to keep this site running. Oh this is rich —- Anthony TELLS Kyra & Cory — we’ll LIE and blame the lie on Kiki — all to save Adam/Dane from calling them out with Kyra telling on them wanting to backdoor Cory. Ummmmmmmmmmmmm hello Cory? Kyra? Does this NOT point out to you what is really going on here? 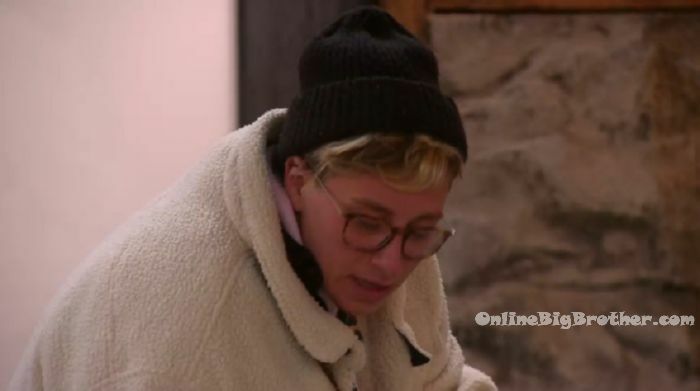 The fact Anthony is okay painting Kiki with a lie in order to not cause issues with Adam/Dane should be a HUGE RED FLAG for you ladies! Also? Adam? Still supremely unattractive. Also? Dane is an asshat. Thank Gawd for “Survivor” I’m done. Life is too short. Simon and Dawg thanks for stick’n with it. Hopefully the pain ends soon and you can go home to your family. lol Supremely unattractive?? Someone is bitter… rejected by men too often maybe? This season has BY FAR the best cast ever on BBC. This is my first season following the Canada edition. Not much different than the US. Women always seem to go after each other. They want to be with the men. They make it to the end by being low person on the totem pole and they are easy to beat (Victoria), or BB sets it up for them( Nicole). I miss the days of women like Janelle. yet kyra got the blood veto should interesting i bet mark goes home know!